Over the past two decades, an unprecedented number of tall buildings have been constructed around the world. 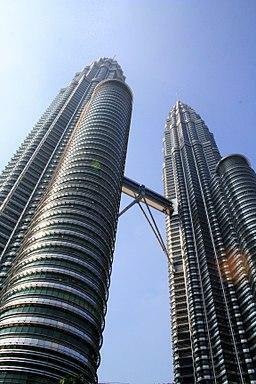 The world of skyscrapers began to change rapidly in 1998, with the completion of the Petronas Towers, twin towers in Kuala Lumpur (Malaysia). These 482 meter (1,483 foot) structures ended the quarter century reign of the Willis Tower (Sears Tower---442 meters, 1,451 feet) in Chicago. In the past, the United States had been exercised something of a near monopoly in skyscrapers. 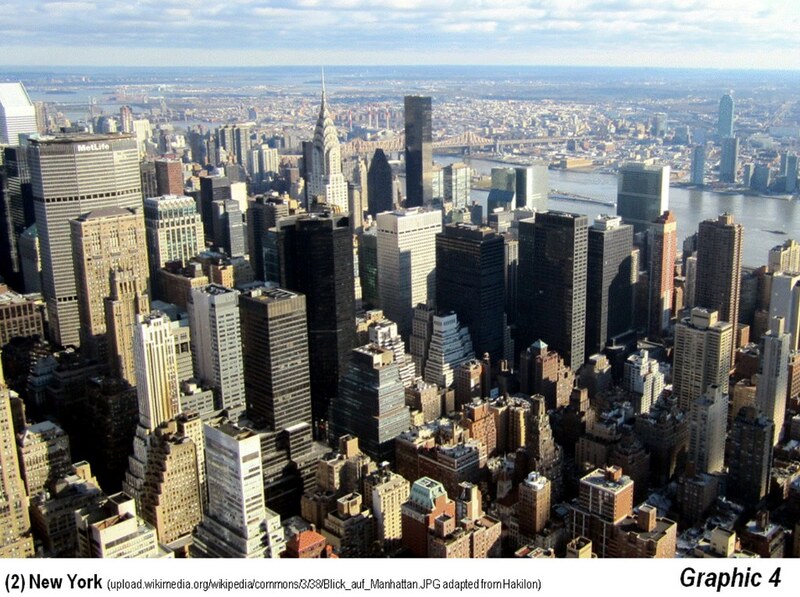 As late as 1962, nine of the world’s tallest buildings were south of 59th Street in Manhattan. The world had changed little by 1981, when Manhattan still had five, Chicago three and the US nine of the top 10. Toronto had joined the top ten, in ninth place (see: 125 Years of Skyscrapers). Now, only one of the tallest 10 is in the United States, One World Trade Center in lower Manhattan. This article provides a summary of the 10 world municipalities with the greatest concentration of the tallest buildings (150 meters or 492 feet and more). The information is from the The Skyscraper Center, the database (accessed 24 January 2018) of the Council on Tall Buildings and Urban Habitat which provides a information on all 150 meter (492 feet) and higher buildings, by city. 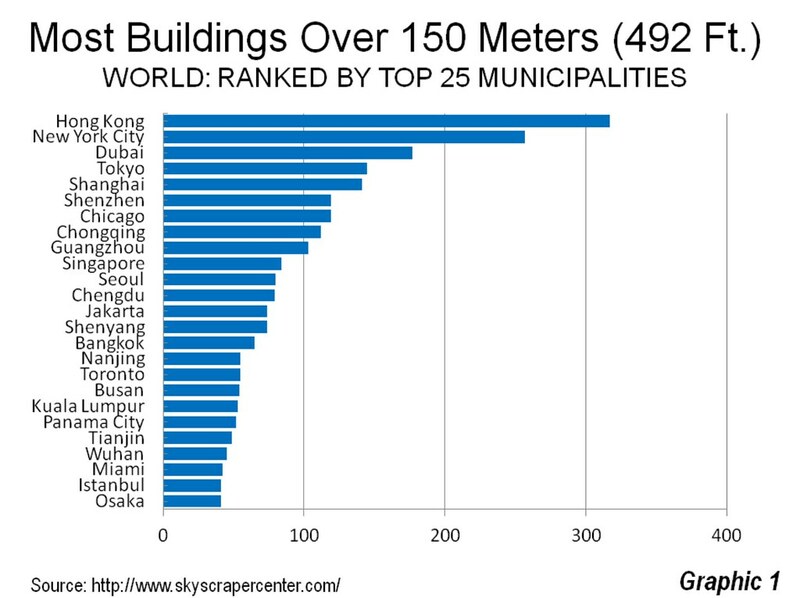 East Asia is dominant, with seven of the top 10 municipalities with the tallest buildings. Of the top ten, seven are in East Asia which also accounts for 18 of the top 25 (Graphic 1). Hong Kong: Hong Kong has taken the title of the most 150 meter (492 feet) buildings away from New York, with The Skyscraper Center indicating its count at 317 to New York’s 257. However, this dominance includes only one building among the world’s Top 10 tallest, the International Commerce Center (Graphic 2). 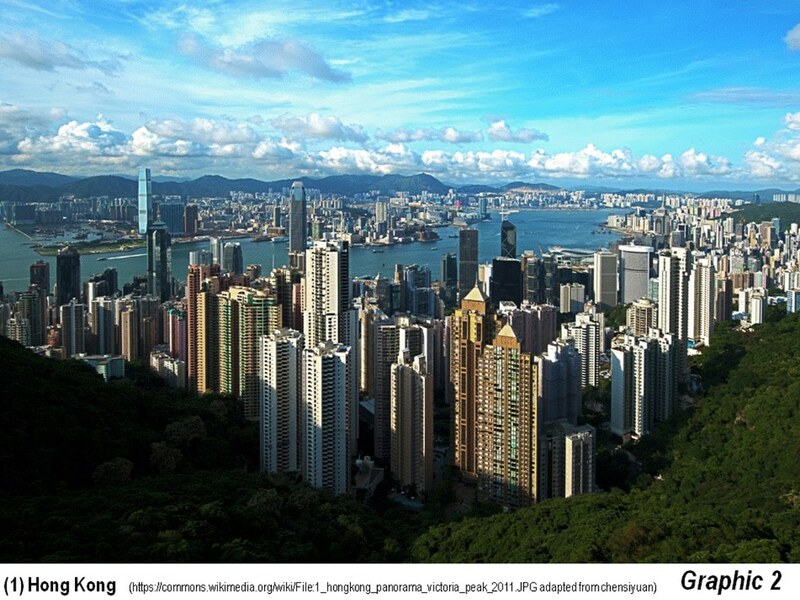 Hong Kong may be the ultimate in the dispersion of tall buildings, as Graphics 2 and 3 indicate. Beyond the sectors in the two graphics, there are a number of other communities with very tall residential buildings. Graphic 2 shows Hong Kong, with the commercial core of Central, a part of Hong Kong Island, at the bottom, Hong Kong Harbor in the middle (actually it is more of a strait than a harbor) and Kowloon across the harbor. The tallest buildings, and most of the tallest commercial buildings are located on Hong Kong Island. Across the harbor, Hong Kong’s tallest building is now located in Kowloon (completed in 2010), the International Commerce Centre. Kowloon has very tall residential buildings, but most are much farther to the north or east, nearer to the mountains. 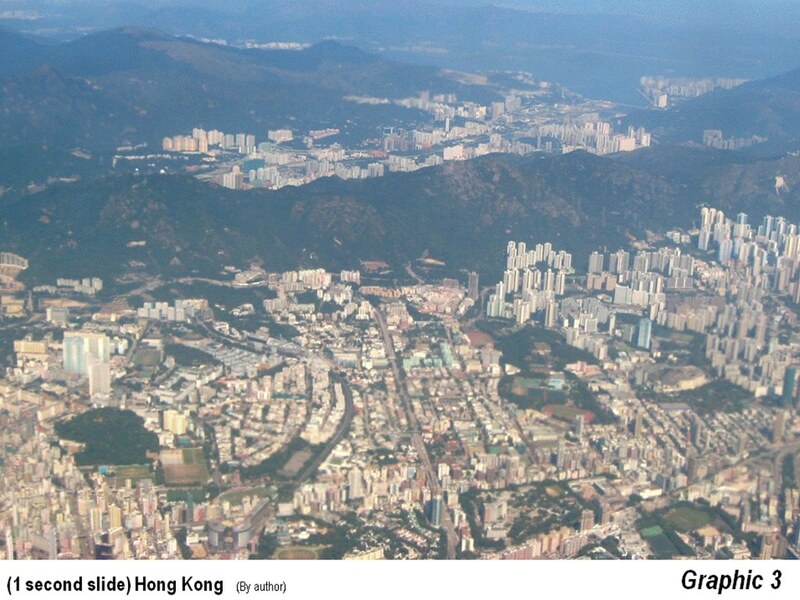 Graphic 3 shows northern Kowloon from the air, with many tall residential buildings. Across the mountains, more tall residential buildings are evident in Sha Tin, which is in the New Territories. The New Territories how holds the majority of Hong Kong’s population. Also visible in the upper right corner is Ma On Shan, with more tall residential towers. Tai Po, again with tall residential towers, can be partially seen over the mountains from Sha Tin. The other Pearl River Delta cities have almost as many 150 meter buildings as Hong Kong (Shenzhen, Guangzhou, Dongguan, Macao and Zhuhai). With a total of 593 150 meter buildings, the Pearl River Delta has nearly 15 percent of the 150 meter buildings out of the top 200 cities ranked by The Skyscraper Center (this includes all cities with more than one such building). New York: For at least 100 years from the completion of the New York World (newspaper) building in 1890, New York dominated the world in skyscrapers. With virtually all of those buildings concentrated on Manhattan, south of Central Park, New York boasted indisputably the most impressive skyline in the world. But, New York has now relinquished the crown to Hong Kong. New York ranks second to Hong Kong. Graphic 4 is a northeasterly view of Midtown Manhattan and includes the Chrysler Building, first to reach 300 meters and briefly the tallest in the world. The photograph is taken from the Empire State Building, which was the tallest in the world for four decades, the longest reign of any building in more than 125 years of skyscraper history. There are also a number of more than 150 meter buildings in the rest of Midtown, as well as in Lower Manhattan, where the country’s tallest building, One World Trade Center, is located. One World Trade Center is now the 6th tallest building in the world, but will be bumped out of the top ten by the early 2020s with the taller buildings currently under construction. For the first time in skyscraper history none of the tallest 10 buildings will be in the United States. Dubai: Third, where virtually all of its tallest buildings have been built in the 2000s, ranks third, with 177. 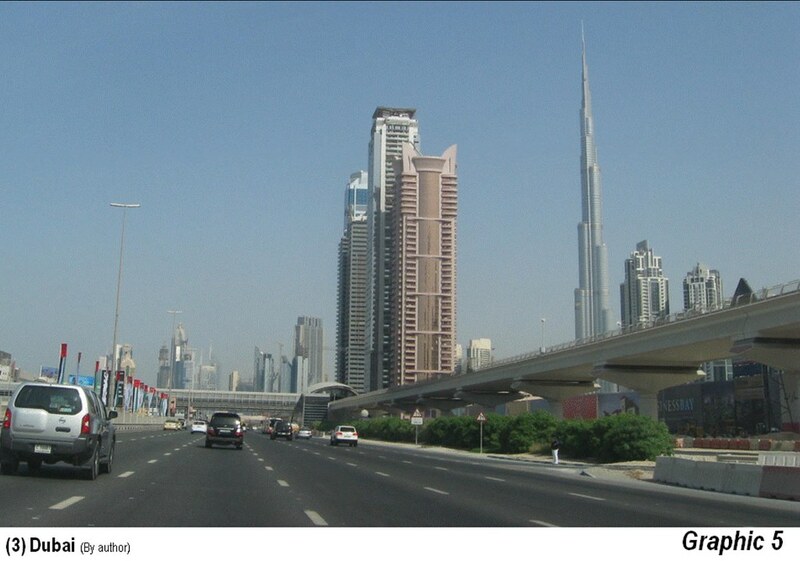 The tall buildings of Dubai are widely dispersed, many along the 12-lane Sheikh Zayed Road. Graphic 5 shows the world’s tallest building, the Burj Khalifa is located to the right of the freeway. Dubai has by far the largest number of buildings of 300 meters or more. 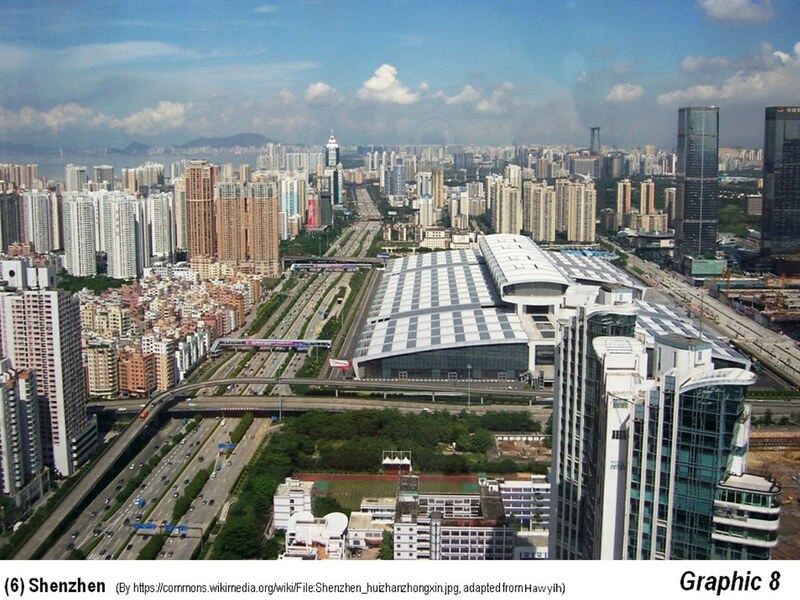 Guangzhou, with 9, is the closest to Dubai in 300 meter buildings. Just to the north of Dubai, is another municipality, Sharja, which ranks among the top 100 in 150 meter buildings. 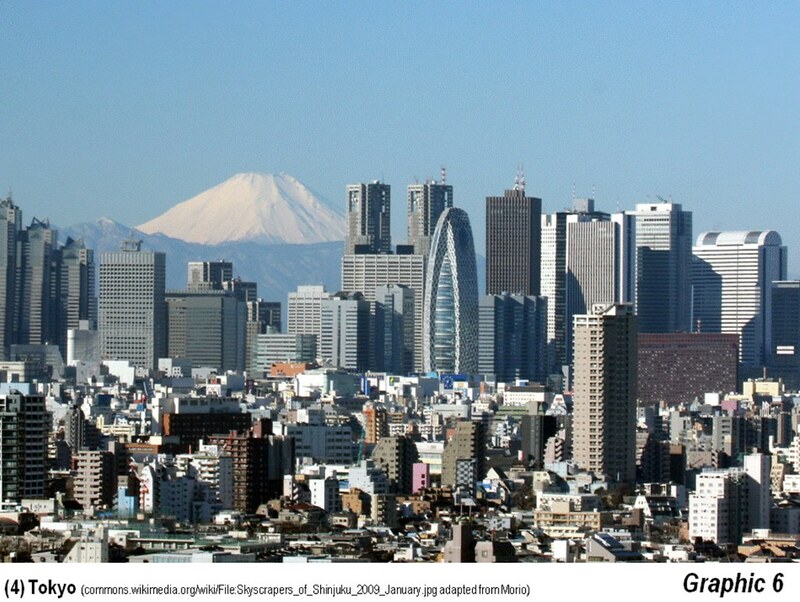 Tokyo: Tokyo has the fourth largest number of 150 meter buildings, at 145. Graphic 6 shows the skyscrapers that have developed over the past two decades near Shinjuku Station, well to the west of the traditional central business district near Tokyo Station. Shanghai: Shanghai ranks fifth in tallest buildings, with 141. 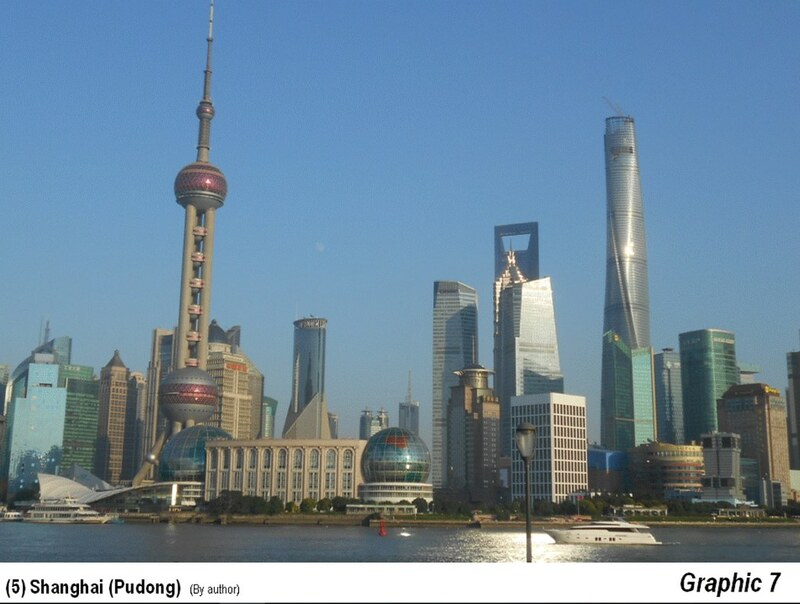 Graphic 7 is a view of Pudong (Lujiauzi) across the Huang Pu from the Bund (see A Tour of the Bund in Shanghai). The world’s second tallest building is shown (Shanghai Tower). Shanghai’s traditional central business district is located in Puxi (west of the Pu), which has fewer tall buildings, but includes the popular tourist destination, East Nanjing Road. 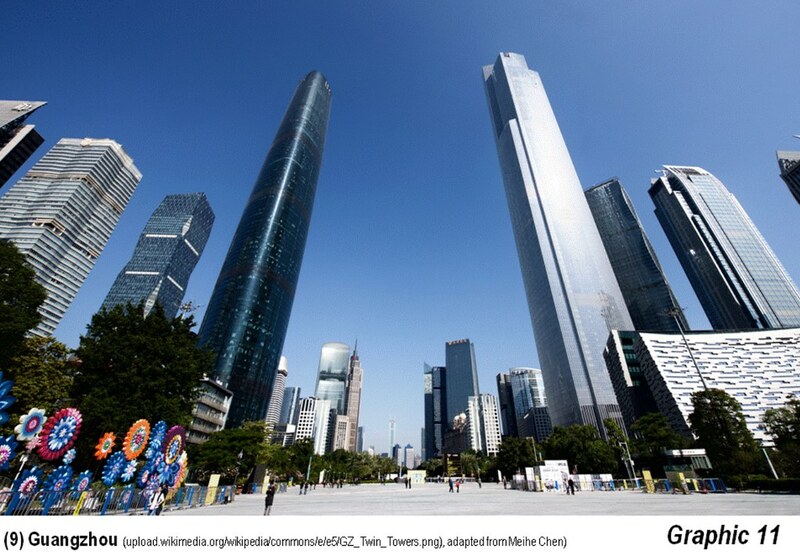 Shenzhen: Shenzhen is tied with Chicago in tallest buildings, with 119. Graphic 8 is a view of Shenzhen. Shenzhen is now home to the world’s fourth tallest building (Ping An Finance Centre). Like many Chinese cities, Shenzhen’s tall buildings are widely dispersed. Shenzhen is particularly impressive, because the current city was largely rural (virtually no urbanization), as late as 1980. Today, its population is more than 10 million. Chicago: Chicago is tied with Shenzhen in tallest buildings, with 119. 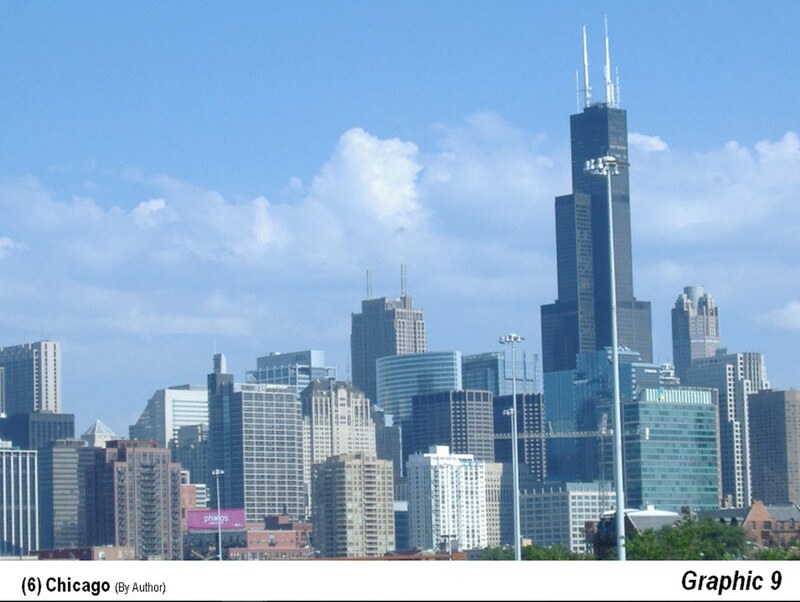 Graphic 9 is the Chicago Loop from the Kennedy Expressway, including the Willis Tower, the world’s tallest until 1998. Chicago is considered the “birthplace” of the skyscraper. Chongqing: Eight ranked Chongqing has 112 of the tallest buildings. Graphic 10 is of Chongqing’s central business district, which has one of the most dominant central business districts in China, somewhat similar to North American central business districts (See: Downtown China). Guangzhou: Ninth ranked Guangzhou has 103 of the tallest buildings. 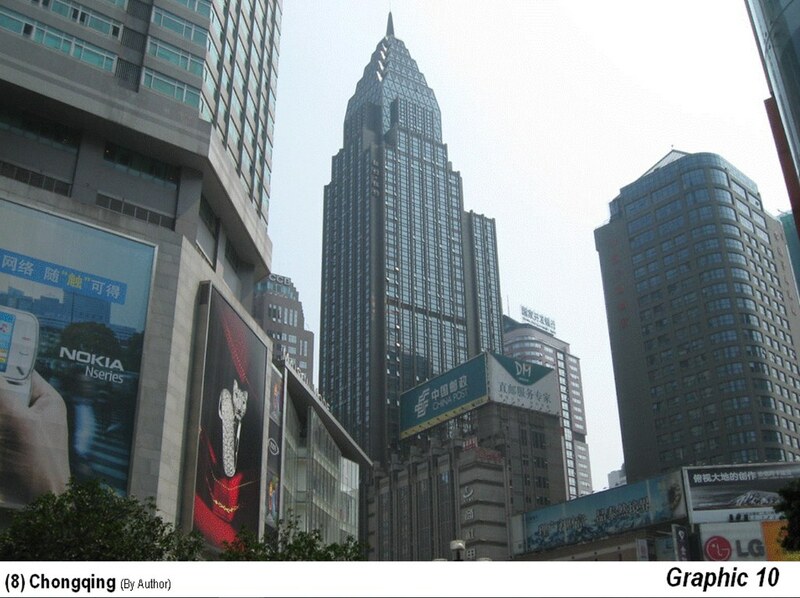 Guangzhou has 9 buildings over 300 meters, second in the world only to Dubai. Graphic 11 shows the two tallest, across the street from one another, in the Tianhe district, the Guangzhou CTF Finance Center, 7th tallest in the world, and the Guangzhou International Finance Centre, 16th tallest in the world. Singapore: Tenth ranked Singapore has 84 of the tallest buildings. 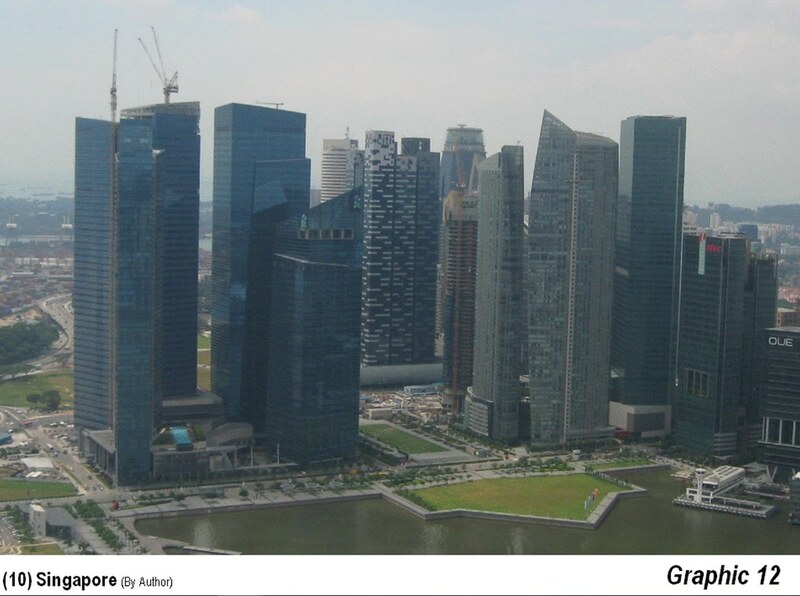 Graphic 12 shows part of the central business district of Singapore from the Marina Bay Sands Hotel. Among the 25 tallest buildings currently under construction 18 are in East Asia and a total of 21 are in Asia, which includes two more in the Middle East and one in India. The Jeddah Tower, in Jeddah, Saudi Arabia will be the tallest in the world, at 1,000 meters, 170 meters higher than the Burj Khalifa in Dubai. Two of the 25 will be in New York, and two in Russia (St. Petersburg and unlikely Grozny in Chechnya). But the biggest of the big seem destined to concentrate in Asia for the foreseeable future.